In the last post on this subject, I wrote about how miners were able to remove almost all the coal from a section, either by leaving small remnant pillars or building packs to hold the roof in place, while that coal was removed. By retreating the face back towards the shafts the overlying roof rock was then allowed to collapse into the void left by the coal removal. 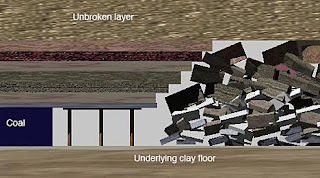 However, as this process began to evolve the miners noticed a couple of significant things that helped in the understanding of how the roof was responding, and helped to make longwall a safer and more effective method of mining. 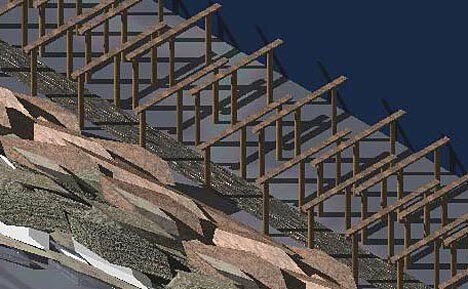 The first was that at the roof broke behind them, so the rocks would bulk up (they gain about 60% volume as they break and pile). Within a distance of about 2 seam heights, as the roof was converging, without underlying support, it would then meet the broken pile of rock, and thus get some support from this. As a result any support that the miner installed would not need to carry the full weight of the overlying roof to the surface, but only that of a few feet, which needed much less strength. Thus by about 1870, and possibly in the Lancashire coalfield in the UK, they had modified the process further, and were only supporting the roof around the actual mining operation. How could they get away with this? There was one other fact that helped make it possible. In some of the earliest tech talks I mentioned that the weight of the overlying ground can be simplified to being around 144 lb./sq ft for every foot of depth – based on the simplifying assumption that a cubic foot of rock weighs 144 lb. Thus converting this to a pressure in lbs/sq inch. (of which there 144 sq ins to a sq ft) this means simplistically that for every foot of depth one goes into the ground, the pressure increases by 1 psi. Now when you make a hole in the ground, that load, or equivalent rock pressure, has to move somewhere. And it moves just a little so that the weight of the ground over the hole is carried by the rock on either side. However, what happens if this additional load is too high for the rock and it fails? Well if the rock were just a thin column it would collapse, but if it were thicker, then the weight would just move further into the coal. Now if we came along and moved the coal that had failed, then the hole would just continue to get bigger. But if we leave the coal in place, then the broken coal acts to confine the coal further into the solid. And this confinement gets higher, as the failing pressure continues to move into the wall. And what happens is that this confinement builds up the strength of the coal, so that at some distance into the wall (or face) the coal strength reaches a point that it can carry the weight of the ground above the working area. (For a simple analogy think of a deck of cards, which individually cannot bear weight, but when held together by a rubber band, or a carton, can support quite a bit of weight). (And for those who prefer a more scientific description – the lateral confinement moves the failure from two-dimensions into three, with the minimum principal stress building as one moves into the solid material, and raising the overall failure stress behind it). This works not only for the coal in pillars, or ahead of the working face of the longwall, but also for the rock that has fallen into the waste and is confined by the rock around each piece allows it to regain some strength, and so collectively the broken rock behind the working face (called the goaf or waste) will continue to compress as the full load comes on it, but will carry the weight of the ground from about twice the seam height, all the way to the surface, and with the other end of the "bridge" as it were resting on the confined coal ahead of the working face. (While the width of this bridge varies with depth, coal and rock strength etc, for an initial estimate you can imagine it as being around 500 ft). Simplified side view of the coal as the miners removed the coal along the face, moving to the left. They put up wooden supports (three wooden props and a top bar) and let the roof behind the working face that these protected, collapse. View looking down on the working area from the top of the fallen rock pile. I have erased a small section of the coal to show the position of the cutter bar of the coal-cutter as it is either dragged, or self propels itself along a cable stretched down the working face. 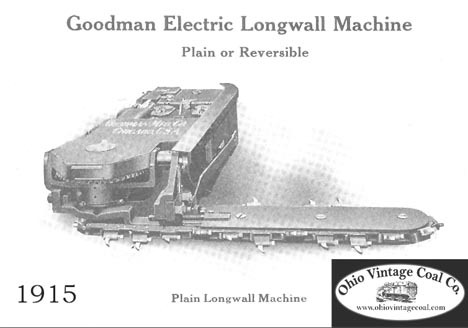 In the initial working of the longwall panel, the coal was undercut by a team of holers, who each cut a slot at the bottom of the seam, to a depth of about 3-ft, and collectively undercut the face over the course of a shift. As the faces grew longer there was a search for a machine that would make that undercut without the intensive manpower. One such tried to mechanize the simple swinging action of the pick. 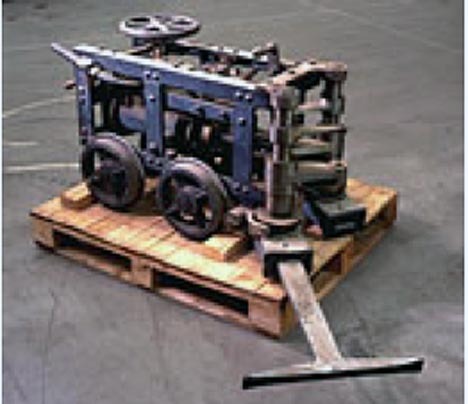 The development of the machine, the coal-cutter, dates from around 1876 when a compressed air machine was developed by Francis Lechner, in which picks mounted on a chain, did the cutting of the coal. (The more modern versions of this look like a chain saw on its side). It took a number of years for the machine to evolve into something that was widely accepted, and by that time the company had been taken over by Joseph Jeffrey (a banker) and became Jeffrey Manufacturing Company. (By the time my dad worked for them they had become British Jeffrey Diamond, and they later became part of the Dresser Group). They had spread to Europe by 1905. And electrically driven machines were developed, which have not changed that much in the intervening years. With these machines pulled along the face, undercutting the coal, to give a cut depth that was more typically 7-ft deep, the next step was to break down the overlying coal. Sprags (small wooden wedges) were slipped into the slot at intervals, as the cutter passed up the face – usually run by three men. At the same time holes were being drilled along the face, about 6 ft apart, with a stick of dynamite placed in each one. After the face had been undercut the coal was blasted down between shifts (7.5 hours) then the collier shift would come in and each man would have about 10 yards of face to load the coal from, and to re-support. 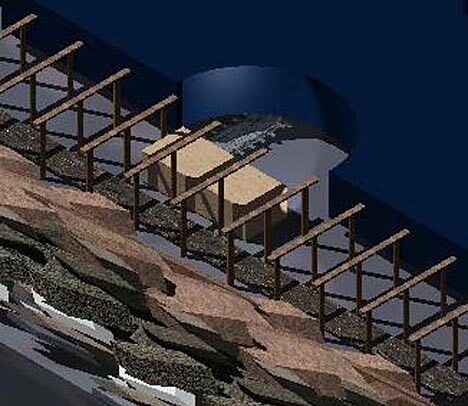 To get the coal from the face, a rubber conveyor belt was run along the back end of the supports that were in place before the blast, and the coal would normally not break that far from the face. As the miner shoveled he would also put in a new set of timbers, overlapping the old, and supporting the new working area. Typically this would take another seven hours, with an ideal seam height being about 4.5 ft. Above that the coal volume to move was much greater, and below that it got a bit awkward. For example, below 2 ft thick you lie on your back, with a prop under your shoulder and shovel over your head - how would I know? Yes, there was a reason to go to college). View of the face, after the coal has been loaded out. The rubber coal conveyor between the last two rows of props must now be broken into strips, and moved forward a row, ready for the next cycle. Then the back props and bars are removed. (Saving the front two props and chopping out the back one). In the third shift, the men would come in and break down and move over the conveyor belt, and then remove the last row of wooden supports, bringing the roof down, beyond the new line of supports. (Smart folk would use a come-along and a chain to pull down the props, young idiots (guess who) would go in with an axe to chop them first). For this was the state of the industry when I went to work in it in 1961. There have been many changes since. Dich vu ke toan ACB chuyên cung cấp dịch vụ kế toán trọn gói uy tín chuyên nghiêp giá rẻ nhất tại HCM và các tỉnh lân cận với chi phí bỏ ra từ 500.000-1.500.000đ. Liên hệ: Dich vu ke toan , Dịch vụ kế toán. Lầu 4, Tòa nhà Long Mã, 602 Cộng Hòa,P.13,Q.Tân Bình,HCM. Hotline: (08) 62 97 97 97 - 0966 660 888. Deepwater Oil Spill - should oil flow restart? Deepwater Oil Spill - the last cement job?